Tips For Eating More Plants - Welcome to SarahKesseli.com! One of my clients and I were having a conversation about Michael Pollan and his books last week. This particular client eats very well and does not have an issue getting in plenty of vegetables. However, her concern was that most people don’t know how to eat enough vegetables. She said, “Pollan stated in one of his books, ‘Eat Food. Not Too Much. 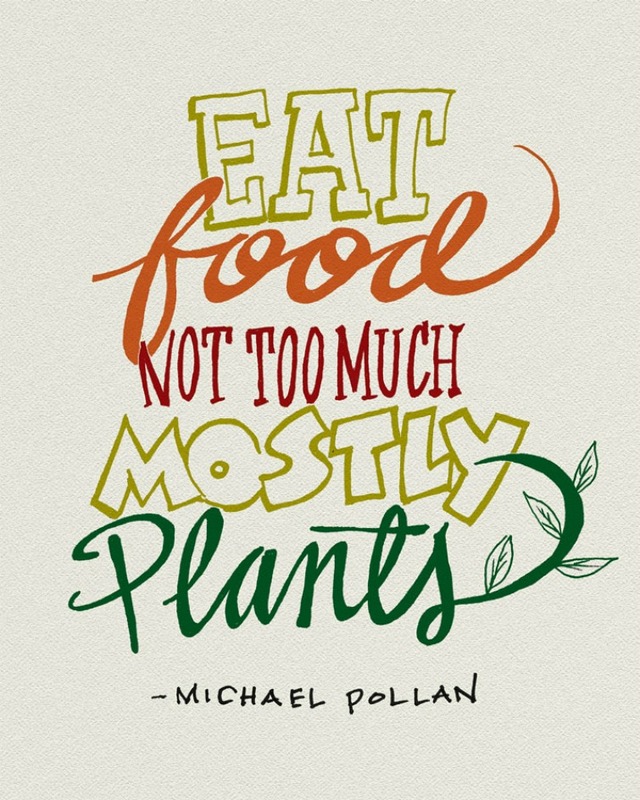 Mostly Plants.’ I don’t think most people know how to eat more vegetables and less processed foods.” That got me thinking. Why don’t I share a few tips on how to incorporate more plants into our diet and thus cut back on some of the refined foods we eat! Make a large batch of soup on Sunday: Take time over the weekend to create a healthy soup that can be eaten all week long! Add in all of your favorite vegetables. When you are rushed during the week you will have a hearty and healthy soup waiting at home for dinner or you can even pack it for lunch at work. You won’t have to worry about grabbing something out, when you know a delicious dish is waiting for you! Swap crackers and chips for veggie stick and hummus or fruit and yogurt: By replacing the crackers and chips, not only will you be adding more fruits and veggies to your day, but you are also cutting down on sodium and getting a healthy dose of vitamins, minerals and fiber! Add Spinach: Spinach is so versatile and can be added to anything! Steamed it and serve alongside some baked chicken, toss it in with pasta, or even add it to a delicious omelet in the morning! This dark leafy green is loaded with vitamins! Swap The Processed Carbs: Instead of having pasta for dinner, try making zucchini noodles or serving your sauce over baked spaghetti squash! Or make nachos using sweet potatoes instead of chips! The possibilities to get in more veggies are endless! Make one GIGANTIC salad: On Sunday make a large salad that you can grab and go when needed! Toss grilled chicken, sliced almonds and goat cheese on top and you have the perfect lunch for work. Or serve it alongside your dinner, so that your whole family can enjoy! Swap soda and juice for a smoothie: Create yummy smoothies using your favorite fruits/vegetables, milk, yogurt and a bit of protein powder (optional). Blend all of these together and you have the perfect breakfast, snack or even dessert!